Pocket sprinkles | Living life in the carpool lane.. This is the story about sprinkles. Yes, those sprinkles. Those sprinkles are M’s favorite ice cream topping. No matter where we go for ice cream, she always wants sprinkles. One time, Hubby and M went on a daddy/daughter date to a local ice cream place. Hubby, always wanting to save an extra buck, decided to put that bottle of sprinkles into his pocket to add to M’s ice cream after ordering it. The ice cream was ordered, and they went outside to eat their treats. 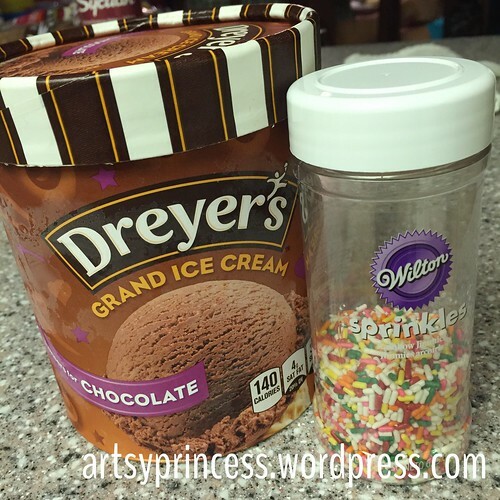 Hubby pulls the sprinkles out of his pocket and adds them to M’s ice cream. She was delighted at the idea of “pocket sprinkles” and Hubby was so happy he was able to save a dollar. It’s totally a thing for our family now. Sprinkles will just never be the same.